The other day, I was pottering about in the kitchen making some food for the dogs, when for no obvious reason, those words floated into my head. Now if you have a passing interest in English literature, you’ll recognise them as the opening lines of a poem by A. E. Housman. It’s entitled Spring and it’s one of his best-known. 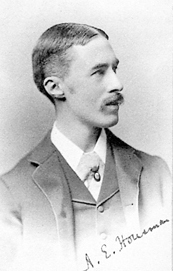 It’s the second poem in his book A Shropshire Lad, a collection of sixty-three poems which Housman published at his own expense in 1896. The emotional feelings and lyricism of these poems resonated particularly with English readers during the years of WWI. The publication became one of the most popular collections of poetry ever written and has never been out of print. “Nothing is as beautiful as Spring” wrote the melancholic poet and Jesuit priest, Gerard Manley Hopkins. There can be no other season that brings such a mood of joyful expectation. It’s the season of rebirth and renewal, full of anticipation of the months to come. Spring has always been a popular theme for poets and composers. It has been celebrated in music at least since the fifteenth century and probably even earlier. Delius wrote Spring Morning and On Hearing the First Cuckoo in Spring, Roussel wrote Pour une Fete de Printemps, Joachim Raff composed Ode to Spring and Karl Goldmark wrote an overture called In The Spring. There’s Schumann’s so-called Spring Symphony and the waltz Voices of Spring by Johann Strauss II. There are dozens more of course, but perhaps the most influential composition on the theme was Stravinsky’s The Rite of Spring composed for the 1913 Paris season of Sergei Diaghilev’s company, Ballets Russes. It caused a sensation at its first performance. I first heard the work when I was about fourteen and thought it was the most thrilling music ever written. In some ways, I still do. Compared to the brittle and grinding harmonies that characterize Stravinsky’s The Rite of Spring, Debussy’s orchestral essay on the theme seems somewhat genteel. Even so, at the time the music was considered “excessively progressive” by the conservatively-minded Fine Arts Academy in Paris. Times have changed since then. Today the music is entirely approachable. The music is in two contrasting movements and the second one (09:44) is full of attractive, infectious melodies. This well-known piece was composed by the most influential member of the Strauss family. “The Waltz King” as he became known in his lifetime, composed over five hundred waltzes, polkas, quadrilles as well as several operettas and a ballet. Music historians are sometimes sniffy about the Strauss family, because they wrote what was essentially popular music. But at the same time, Johann Strauss II transformed the simple waltz into a relatively sophisticated art-form and in so doing created a unique style which was quintessentially Viennese. Strauss became one of the most popular waltz composers of the era and with his orchestra toured Austria, Poland and Germany and later, in the 1870s the United States. Voices of Spring was originally written with an optional soprano part and this elegant performance, conducted by the incomparable Carlos Kleiber was recorded at the Vienna New Year’s Concert 1989. If you want to hear Johann Strauss from the horse’s mouth so to speak, you can’t do any better to listen to the Vienna Philharmonic. For members of this orchestra, the music of the Strauss Family runs in their blood. Watching this video you might get the impression that Kleiber isn’t doing very much. But the work was already done. He was famous for lengthy and painstaking rehearsals. At his Covent Garden debut in a performance of Der Rosenkavalier, Kleiber spent a staggering three hours rehearsing the first eighty seconds of the music. Back in The Old Country the spring months are March, April and May. The inevitable rise in temperatures causes new plant growth to “spring forth” giving the season its name. This year the first day of spring in the northern hemisphere fell on Wednesday, 20th March. At 10:58 pm GMT, to be precise. To watch these YouTube videos, either use your Smartphone to read the QR codes or go to this article online, click on the “live” links and go direct to the videos. If you have a laptop, sound quality can be improved significantly by using headphones or external speakers.